At first glance, this Air King may be very easily mistaken for its 1016 counterpart. However, the dial markings are not quite Explorer. Equally, the well-aged indices are raised. 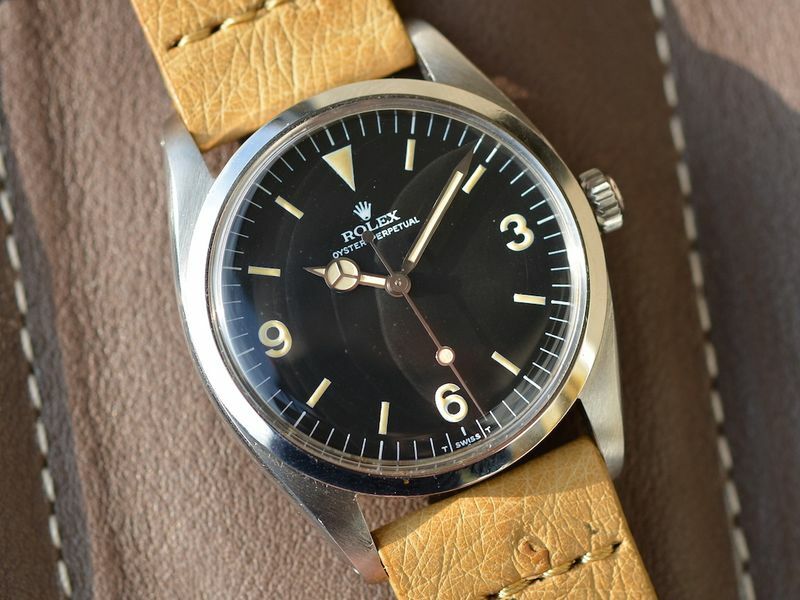 Its 36mm case was used for both models, though some 5504s produced with 1016 Explorer-styled dials blur this line. The 1530 movement also varies from the 1570 in most Explorers. The cal 1530 was a base for all Rolex movements at this time, with a 18000 bph Breguet hairspring. The latter 1570 ran at 19800 bph. That’s the main difference between references. However, the dial in this Air King lacks any model designation. If you’re after the ultimate in clean, vintage Rolex aesthetic, it would be difficult to do any better. Really, it’s an unmarked gem. Find it here from Brevet for an undisclosed sum.